When warm air invades the polar region, it can split the vortex or displace it, usually toward Siberia, Cohen said. Recently, there have been more splits, which increase the odds of other places getting ultra-cold, he said. When the forces penning the polar vortex in the Arctic are weak, it wanders, more often to Siberia than Michigan. And it’s happening more frequently in the last couple decades, Furtado said. I wonder if they ever think about where the Warm Air goes when it “invades” the arctic? Winters have always had blasts of cold air. Exactly, hunter! Tonight’s low will be no where near a record. It’s January. It gets cold. Borenstein puts a Halloween mask on weather. Only children will be scared. Saturday: Partly sunny, with a high near 37. South wind around 10 mph. Saturday Night: Mostly cloudy, with a low around 22. South southwest wind 5 to 10 mph becoming north northwest after midnight. Sunday: A 20 percent chance of snow. Mostly cloudy, with a high near 28. Northeast wind around 10 mph. Saturday: Mostly sunny, with a high near 31. Saturday Night: A chance of snow after 2am. Mostly cloudy, with a low around 25. Sunday: A chance of rain and snow. Cloudy, with a high near 42. Sunday Night: Rain and snow likely. Cloudy, with a low around 29. Monday: Rain and snow likely. Cloudy, with a high near 39. I recall when the Global Warming movement realized that reality wasn’t cooperating and they rebranded to “climate change”. They also spent years (and millions$) on “messaging”. Skeptics derided the amount of time and money squandered by alleged Scientists on marketing and messaging. Normal weather, even normal seasonal changes, have been “repurposed” into “extreme weather”, etc. The climate scammers have been a step ahead in pushing this B’s for years. Reality itself has been hijacked by this wicked social madness. Climate “scientists” are always eager to establish a “new normal” for “anthropocene”. Notice all the quotes in that sentence. Newspeak is descending upon us. The tone of climate scientists back in 1975 was really quite different than today. And part of that paper seems to address the cause of the polar vortex. “During cooler climatic periods, however, the high-altitude winds are broken up into irregular cells by weaker and more plentiful pressure centers, causing formation of a “meridional circulation” pattern. These small, weak cells may stagnate over vast areas for many months, bringing unseasonably cold weather on one side and unseasonably warm weather on the other. Hum, reminds me of the winter of 1976-77. Very cold in the mid west USA, warm in Alaska. I do wonder if it’s the warm air pushing north to shed heat, or cold air shifting south to chill things that warms the far north? South? SSW comes from the stratosphere as the middle S indicates. Met Office: air in the stratosphere starts to collapse in to the polar cap and compress. As it compresses it warms, hence the stratospheric warming. So how long have they been measuring? The first continued measurements of the stratosphere were taken by Richard Scherhag in 1951 using radiosondes to take reliable temperature readings in the upper stratosphere (~40 km) and he became the first to observe stratospheric warming on 27 January 1952. After his discovery, he assembled a team of meteorologists specifically to study the stratosphere at the Free University of Berlin and this group continued to map the northern-hemisphere stratospheric temperature and geopotential height for many years using radiosondes and rocketsondes. In 1979 when the satellite era began, meteorological measurements became far more frequent. Although satellites were primarily used for the troposphere they also recorded data for the stratosphere. Today both satellites and stratospheric radiosondes are used to take measurements of the stratosphere. P. S. The vortex wandering is more likely to be due to solar/lunar influences. And I thought it was just due to winter. JKrob – Judah means the pattern is likely to repeat, with varying intensity, for that period. Similar to 2013 when the Jan SSW perturbed the atmosphere for months leading to the very cold March (which incidentally was quite warm before the cold struck) into early April. The Beast from the East over the UK in March 2018 came in 3 waves approximately 2 weeks apart. It was warm in between but the 1st wave had coldest March day ever in some places (since 1878 on CET) and the 2nd wave centered around St. Patrick’s Day had coldest 18 Mar since 1853. The after effects of the SSW from this early Jan are only now just propogating down into the troposphere so will effect the northern hemisphere for some weeks to come. Whether the cold repeats over the US is another matter. Hopefully we get something in Blighty though as it hasn’t done much for us…yet. Chicago is set to experience one of its coldest days on record, with the high temperature expected to be 12 degrees below zero on Wednesday, CBS Chicago reports. That would make it colder than some of the most frigid places on Earth. At its lowest, the temperature in Chicago is expected to plunge to 21 below zero at 8:00 a.m. Wednesday, according to Weather Underground. That’ll feel like 48 below zero with the windchill. Editor’s note (1/29/19): This week’s deep freeze is being caused by the same mechanism that iced the Eastern U.S. in 2014. Our explanation, written at that time, is on target for this week as well; it appears below. Minnesota temperatures same as 1992. They’re screaming about -25 when it hits lower than -30 routinely in central Minnesota almost every year. Meh. “Some 160 warming centers were opened in Chicago, where temperatures could potentially equal or exceed the all-time record of -27 degrees Fahrenheit. With the wind chill, it would feel like -40 or -50, officials said. “They are life-threatening conditions and temperatures,” Chicago Mayor Rahm Emanuel told a news conference. A cold emergency was declared in the U.S. capital Washington, with additional services put on for the homeless. In the southern city of Atlanta, some 300 flights were canceled Tuesday, and more than 400 were canceled in Chicago, a major regional hub for US airlines. In Canada, the icy temperatures — stretching from Manitoba in the western Prairies region to the Atlantic seaboard — prompted a rare “hazardous” cold warning from the government. These sound like extracts from an ‘end of the world by freezing’ novel, rather than a news bulletin! Amazing but true. The winter 1985 cold wave was a meteorological event, the result of the shifting of the polar vortex farther south than is normally seen. Blocked from its normal movement, polar air from the north pushed into nearly every section of the central and eastern half of the United States and Canada, shattering record lows in a number of areas. The event was preceded by unusually warm weather in the eastern U.S. in December 1984, suggesting that there was a build-up of cold air that was suddenly released from the Arctic, a meteorological event known as a mobile polar high, a weather process identified by Professor Marcel Leroux. The New York Times also pushed Cohen and Francis’s theory of global warming-induced cold. However, many scientists disagree with that theory and, in fact, there seems to be more evidence it’s just plain wrong. “Frankly, it is a stretch to make that link,” Kevin Trenberth, a climate scientist at the National Center for Atmospheric Research, told TheDCNF. A multi-day episode of very cold wind chills continues affecting much of southern Canada. A frigid arctic air mass and brisk winds will result in wind chill values of -40 to near -55 °C (-40 to -67 °F) this morning and again tonight into Wednesday. If the Arctic is warm, as they keep telling us, where is all the cold air coming from? Rahmstorf, as usual, is less than honest. What is it with people Attenburogh and Rahmstorf selling false stories to vulnerable leaders? Only about 2 weeks ago parts of ‘abnormally hot’ Bavaria were over head height in snow. Why do these climate nutters experts have to make such obviously silly statements? Desperation setting in perhaps. Note the numbers for 1996 and 2009 – trend? Take a look at NuSchool Earth and tell us where this warmth is in the Arctic, it should be an area equivelent to the area of cold in the USA. It is nowhere to be seen in the Arctic. 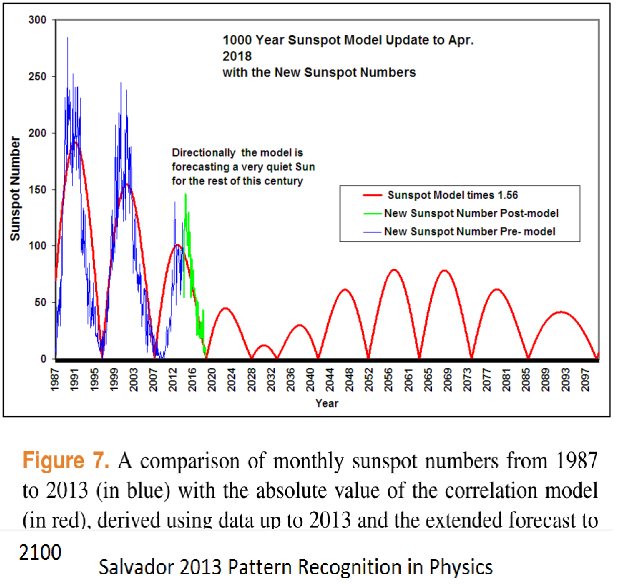 Also from Justin Weather: Modeling shows lower solar activity for the rest of this century. You used a graphic I made at the bottom of the page. My colleague Rick Salvador developed the model and I updated the data on it in green. If you’re still interested in the progression of the data vs our model, please let me know and I’ll keep you updated periodically. In the meantime, please would you substitute in this graphic, which credits the author of the model. I don’t care what you *interpret* what Judah to have said, I only know what Judah *did* say & that is for the cold conditions to persist (presumption – as it is now) which it will not do. The Hudson Bay Low/Polar Vortex/whatever will weaken & retrograde north/west in the near-term…for now. This feature is there in some form every Northern Hemisphere winter so it is nothing new. It is amplified by a large value/blocking high over Bearing Sea. This causes the Hudson Bay low to amplify *and* causes what is called ‘cross polar flow’ – due to the ridge, flow across Siberia/Eastern Russia is directed north toward & across the polar region southward across the Canadian Archipelago, south across central Canada into the US. The more snow on the ground along it’s path, the more the polar air is maintained (stays cold) & not modified (warmed). When the ridge breaks down or retrogrades into Siberia, the Polar Low weakens or retogrades westward with the high. This is all associated with Jet Stream Teleconnections. A life-threatening deep freeze gripped the American Midwest on Wednesday as weather colder than Antarctica grounded flights, disrupted travel and brought life to a standstill for tens of millions. Mail deliveries were suspended, schools and business closed, and residents encouraged to stay home in nearly a dozen states where temperatures overnight sank into the negative double digits, the worst cold to grip the region in a generation with all-time records still under threat. At 7 a.m. CT, it was –40 C in Winnipeg and felt like –50 with the wind chill. In Saskatchewan, Manitoba and northern Ontario, forecasters are warning of wind-chill values of –50 or –55, and in parts of Nunavut –60. “Wind-chill values of this magnitude are relatively rare for this region and are extremely dangerous,” the warning in several northern Ontario regions says. Extreme cold can cause hypothermia and frostbite, and the warnings tell people to watch for symptoms related to the conditions: shortness of breath, chest pain, muscle pain and weakness, numbness, and colour change in fingers and toes. The weather agency also says that frostbite can occur within minutes. I’d like to speculate that the ultraviolet component of solar radiation stabilizes the polar vortex. 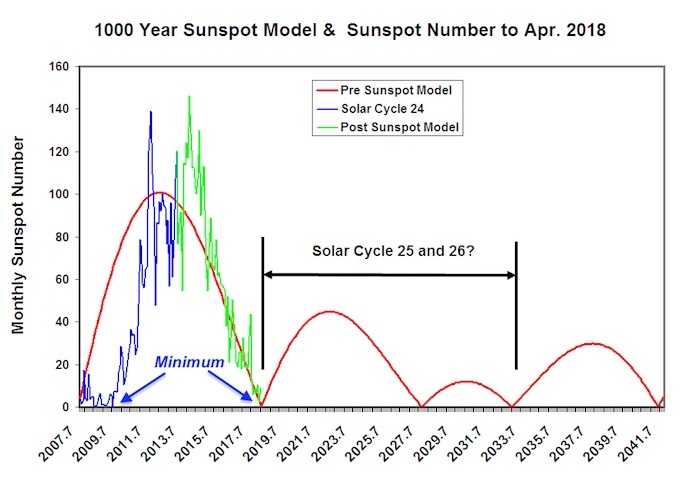 With an active sun, more UV means more radiation absorbed in the stratosphere which means the stratosphere becomes active in the global advection pattern and there is a greater tendency for sinking air near the poles. This would also affect the so-called ozone hole. Stagnant air inside the now stable vortex would become more depleted in ozone while the wall of the vortex would become more concentrated. Does this match the facts? Notice the very warm polar stratosphere recently. Can we associate this with the split vortex? Until the recording in Braemar, it had been thought that Loch Glascarnoch, near Garve, in Wester Ross, was the UK’s coldest place after temperatures there plunged to -13.6C overnight into Thursday. BBC: At least 21 people have died in one of the worst cold snaps to hit the US Midwest in decades. 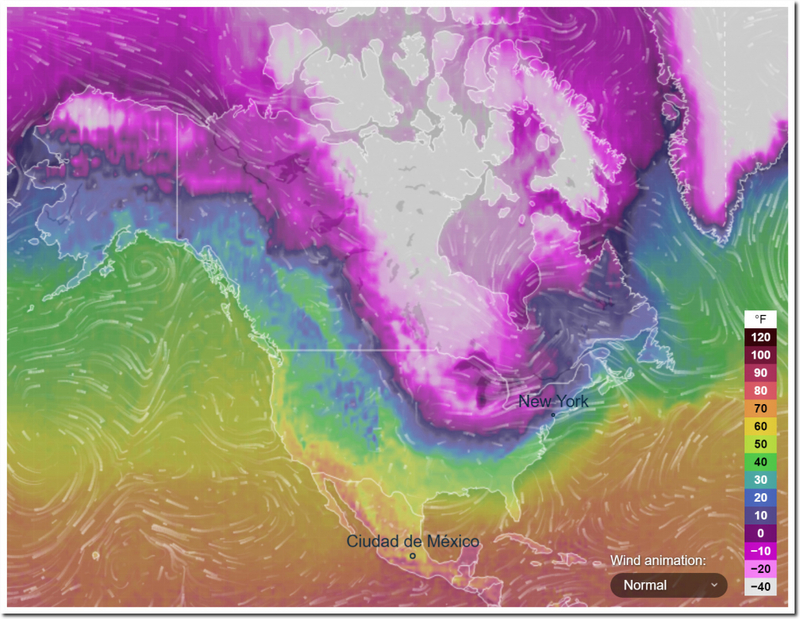 Ninety million people – a third of the US – have seen temperatures of -17C (0F) or below. Some 250 million Americans overall have experienced the “polar vortex” conditions. Cotton, Minnesota, was the coldest place in the US on Thursday with a low of -48C (-56F) based on preliminary data. Even colder in parts of Canada.